On Wednesday, Smith, 75, returned to the theater with dozens of others with questions about the art deco building's future. "People would come here just to have air conditioning in the 1940s," Smith said, recalling how his father and uncles would work at the Marianne every day, running the projector, taking tickets, selling snacks. He would mostly occupy the front row. "Probably why my neck is so screwed up," he laughed. "I didn't need a babysitter." Smith had not been at the Marianne since the late 1950s when he graduated high school, departed for college and the military, and then settled in Cincinnati. Now living in Newport, he returned to Bellevue where the city just purchased the theater that has been closed since the early 2000s with the hopes that a new developer would step up with a plan for the landmark. 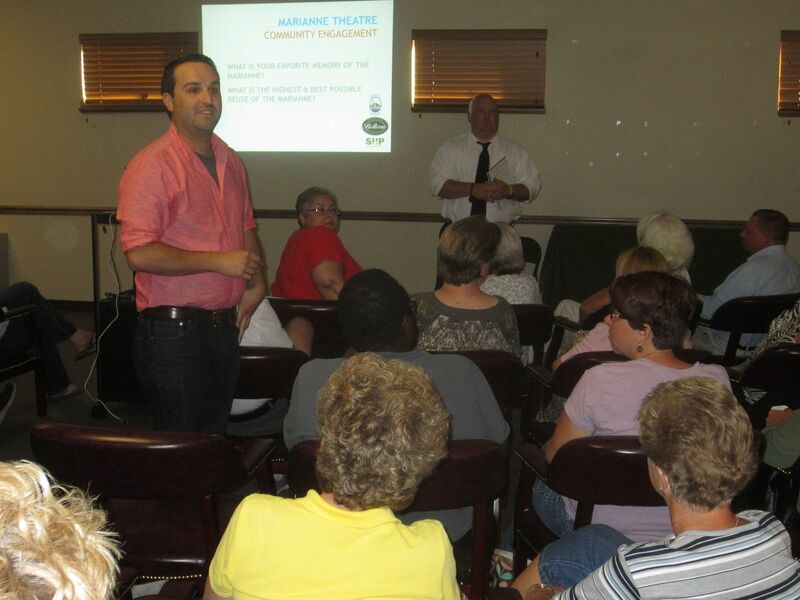 The public was invited to view the 70-year old theater on Wednesday and then attend a public discussion at the Callahan Center afterwards. Jeff Sackenheim, an architect with Cincinnati-based SHP, led the discussion. "This is a pretty significant building. That's why we're here tonight. This is a unique opportunity to do something unique," Sackenheim said. "In a town the size of Bellevue, this is certainly one of those structures that if we do it right, then it will be something really special." But what's right? Many in the crowded room had different ideas. One woman hoped to see it used as a venue for local film festivals, one guy thought it would best be used as a place to combat "the moral deterioration of our culture", while others thought it should be a movie theater again and others thought it shouldn't, or maybe it could be a space for live theater. Jacob Trevino is actively searching for a space to house his Guerilla Cinema project, where a movie is shown along with nine courses and seven cocktails. Professionally, Trevino works at Japp's, a popular bar in Cincinnati. "We have a way that shows these classic movies with very little overhead and have our good food and quality cocktails," he said. The chef for his projects runs the kitchen at Maribelle's in Cincinnati. They have also secured investors, he said. "The biggest problem with our concept is we need a particular type of building. We can't just go into a warehouse and build a theater. We think the Marianne could be a good home for us. We think this area is ready for our concept. We're putting this on the table that we'd like the Marianne to be our home." When the city announced in March that it would buy the property, it did so with the intent of luring an economically viable project. If Wednesday's meeting is any indication, there will be more than one solid idea.